When CAT excavator track drive motors, like those on a Caterpillar 303 CR, come into the shop for repairs or re-manufacturing, the problem can often be traced to a leak between the sprocket and the back side of the hydraulic motor. That particular leak is caused by a failed floating face seal, also called a duo-cone seal or a mechanical face seal. This particular seal keeps the gear oil in the planetary side of your drive. When a face seal fails, two things will happen: (1) the gear oil will begin to leak out and (2) contamination will begin to make its way inside the planetary hub. 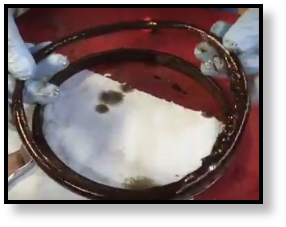 The gear oil leaks between the sprocket and the final drive. As the leak progresses, you'll often find yourself having to top off the gear oil repeatedly. While this makes for a good temporary solution, you can't do this forever. As the seal continues to wear the leak will get worse and you run the risk of running your final drive without gear oil. Dry running results in damage that is much more costly to repair than the downtime associated with replacing the face seals. As the face seal weakens further, debris from the job site can begin to make its way in, including sand, grit, and soil. You can imagine the damage that these abrasive contaminants can cause. 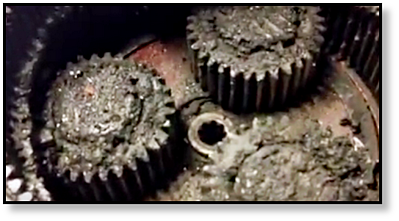 It's not at all uncommon for us to open up a final drive core and discover that instead of gear oil that planetary hub is filled with a useless sludge made up of gear oil mixed with all kinds of debris. This is very, very bad for your final drive. 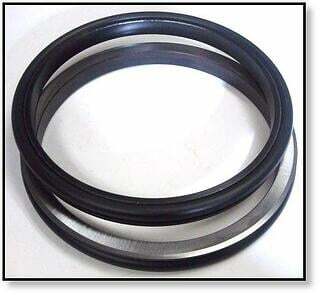 Face seals are hour rated and have a limited life span. They will eventually wear out and need to be replaced according to manufacturer recommendations or when you notice a leak behind the sprocket. One cause of premature failure is related to the excavator undercarriage. If the undercarriage is not kept clean, debris can get packed in so tightly around the drive motor that it pushes the face seal out of place. The smooth mating face of the seal is key to its proper function, and when the face seals are forced out of place then that debris gets wedged between the faces. That abrasive debris can not only forces the faces apart far enough for debris to make its way in, but can scar up the faces and provide additional paths for the gear oil to leak out. First, we cannot emphasize enough that you need to address these leaks quickly. The down-time and basic costs to replace the face seals is far, far less than what it would cost to repair the damage done by ignoring the leaks -- if the final drive motor can even be repaired. Next, keep the undercarriage of your CAT excavator clean. Ideally, it should be cleaned at the end of each shift, preferably with a pressure washer to keep that fatal debris from building up around the drive motors. No matter what brand of excavator you own, leaks should never be neglected -- it means that there is something wrong with your final drive and the problem will only get worse. Many times the worst damage we see on excavator final drive motors is due to a leaking face seal that was neglected just a little too long. Save yourself time and money with a little preventative maintenance.